No one wants to see a good thing go bad, especially when it comes to marriage. Everyone wants anyone to have a happy, loving marriage that lasts forever, but sometimes things that started off good must come to an end. When marriages do end, there is a lot of turmoil. Divorce has an impact on every aspect of your life, including your finances. Assets have to be split, alimony decided, child support ordered, not to mention the high costs of beginning a new life apart. 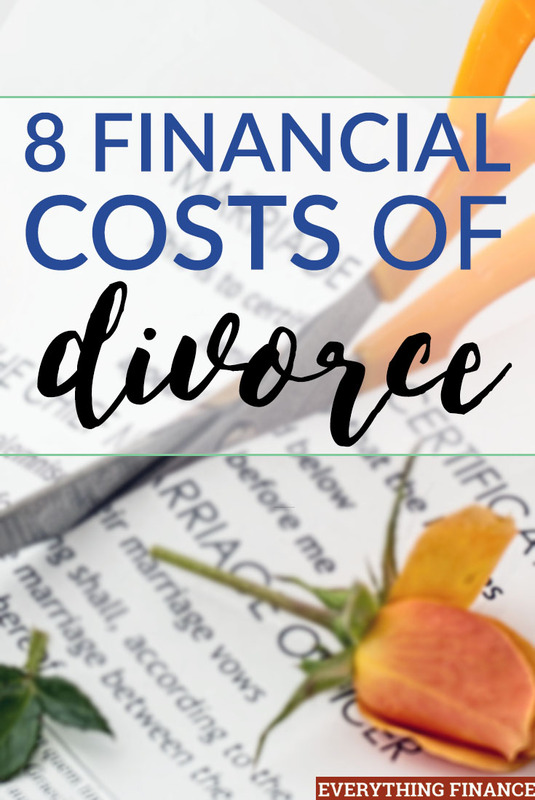 When I got divorced in 2011, I had no idea what the financial costs of getting divorced would amount to. I was lucky enough to not face many costs like alimony, child support, or even much division of assets as I was only married for a few months and we had no children or property acquired during the marriage. The financial costs of divorce can be great if you do face those things, so if you are considering divorce, here are some costs you need to keep in mind. But that may not be all. If a couple can’t mutually decide on division of the assets, there are additional court costs and fees. These can add up to be thousands of dollars if divorce proceedings drag on. The type of lawyer and where you get your lawyer also affects fees. You can shop around, but a recommendation can get you further. Also watch for per hour fees versus flat fees. If you don’t read the fine print, you could end up paying more than you intended. Alimony is the payment by a spouse to their ex-spouse for maintenance and sustainability. Alimony can be determined by a judge, or it can be decided between the two parties outside of court. Alimony can be for life or for a limited amount of time until the dependent spouse is deemed independent. The payments can range in amount and type such as lump sum or transfer or title of property. When I got divorced, I wanted to keep things simple since we weren’t married for all that long and owned little in the way of possessions or property. I was still a college student while my then-husband was working full-time, so I probably could’ve been awarded alimony and court costs to pursue being paid alimony. Child support can range in price depending on how many children you have, where you live, and more. This doesn’t even include the legal fees you’d incur during a custody battle for your children. This can be a lengthy, drawn-out process, and the longer it takes, the more it will cost you. If whoever is paying the support doesn’t pay it, the issue can go back to court, resulting in more legal costs and emotional woe. There is something to be said here for the children’s well-being, too. Their emotional response can lead to increased medical fees for counseling, legal fees, and guilt buys such as toys and clothing to try and help them heal and stay happy. Going through a divorce is rough on all parties, even if the divorce is mutual. This stressful time can make one sick, taking time away from work, causing you to be less productive. You may also find yourself spending more money on eating out as you don’t feel like cooking. Seeing Coupeville Law Office can be a huge help through a divorce, but can be costly. Taking a “break from life” to go to a wellness spa or mini-vacation can drive up unplanned expenses, fueled by the divorce. Or you might even find yourself shopping to make yourself feel better. The majority of my credit card debt from shopping was incurred shortly after my divorce because I shopped to make myself feel better. Not all divorces end with both parties staying in the same city. Sometimes one spouse moves across the state or even out-of-state. With moving to a new location, you have moving expenses, a potentially higher monthly rent or the cost of buying a new home, buying furniture and home items, and more. You can also have the financial strain of trying to find a new job or having to work a couple of lower paying jobs until you find the position you want. There’s rising cost of living to think about, too, if you move to a larger city or more popular area. If your spouse “got everything” in the divorce, starting over with furniture, vehicles, household goods, etc., is expensive. Even if you shop thrift stores, online markets such as Craigslist, and other second-hand shops, the costs of starting a new household can be high. To keep costs down, try to buy only what you need right away and spread the rest out over the coming months as you get back on your feet. After the divorce, they might have to make some sacrifices in their lifestyle since they’ll no longer have a working spouse to contribute to the household. That can be a major adjustment in spending habits. Pre-nuptial agreements are usually thought of as things that only celebrities marrying one another need rather than your average Joe. But pre-nups can save anyone a lot of heartache as it pre-defines how assets will be divided if the couple ever decides to divorce. Pre-nups can protect the inheritance of children from a previous marriage, protect a business or money lost by giving up a lucrative career after a marriage, and more. Losing these things can be a huge financial blow to either party should the worst happen. Divorce does not have to cost that much if all parities “play nicely” and the proceedings go uncontested. It’s when things get heated and no agreements can be made that costs go up and the proceedings take longer. Anything drawn out, especially custody arrangements, add to your cost and can make things more unmanageable financially and emotionally. A great support system can help ease the financial and emotional burden of going through a divorce. Watching your budget as closely as you can, and making sure to form new sustainable financial habits (not dangerous one based on emotions), is the best way to come out ahead when going through a divorce. Can you think of any other financial costs of getting divorced? Have you or anyone you know experienced a pricey divorce?